What is the Convergence Report? The Convergence Report forms the basis for the Council of the EU decision on whether a Member State fulfils the conditions for joining the euro area. The report assesses whether Member States that have not yet fulfilled the necessary conditions for the adoption of the euro (so-called Member States with a derogation) have achieved a high degree of sustainable economic convergence, measured in terms of price stability, sound public finances, exchange rate stability and convergence in long-term interest rates. The report also assesses the compatibility of their national legislation with Economic and Monetary Union (EMU) rules set out in the Treaty on the Functioning of the European Union (TFEU) related to the independence of national central banks, the prohibition on monetary financing, and compatibility with the statutes of the European System of Central Banks (ESCB) and of the European Central Bank (ECB). The Convergence Report by the European Commission is published with the Convergence Report by the ECB. The two reports are prepared independently and published in parallel. Convergence Reports are issued every two years, or when there is a specific request from a Member State to assess its readiness to join the euro area, e.g. Latvia in 2013. All Member States, except the United Kingdom and Denmark, are required to adopt the euro and join the euro area. The UK and Denmark are therefore not covered by the report. What does "Member State with a derogation" mean? The Member States that have not yet fulfilled the necessary conditions for the adoption of the euro are referred to in the Treaty on the Functioning of the European Union (TFEU) as “Member States with a derogation”. They differ from Denmark and the UK, which negotiated opt-out arrangements in the Maastricht Treaty. The 2018 Convergence Report covers the seven Member States with a derogation: Bulgaria, the Czech Republic, Croatia, Hungary, Poland, Romania and Sweden. What are the main findings of the report? The report concludes that Bulgaria currently fulfils three out of the four economic criteria necessary for adopting the euro: the criteria relating to price stability, public finances and long-term interest rates. Bulgaria does not fulfil the exchange rate criterion and legislation in Bulgaria is not fully compatible with the Treaty. The report concludes that the Czech Republic currently fulfils two out of the four economic criteria necessary for adopting the euro: the criteria relating to public finances and long-term interest rates. The Czech Republic does not fulfil the price stability and exchange rate criteria and legislation in the Czech Republic is not fully compatible with the Treaty. The report concludes that Croatia currently fulfils three out of the four economic criteria necessary for adopting the euro: the criteria relating to price stability, public finances and long-term interest rates. Croatia does not fulfil the exchange rate criterion. Legislation in Croatia is fully compatible with the Treaty. The report concludes that Hungary currently fulfils two out of the four economic criteria necessary for adopting the euro: the criteria relating to public finances and long-term interest rates. Hungary does not fulfil the price stability and exchange rate criteria and legislation in Hungary is not fully compatible with the Treaty. The report concludes that Poland currently fulfils two out of the four economic criteria necessary for adopting the euro: the criteria relating to price stability and public finances. Poland does not fulfil the exchange rate and long-term interest rate criterion and legislation in Poland is not fully compatible with the Treaty. The report concludes that Romania currently fulfils one out of the four economic criteria necessary for adopting the euro: the criteria relating to public finances. Romania does not fulfil the price stability, exchange rate and long-term interest rate criteria and legislation in Romania is not fully compatible with the Treaty. The report concludes that Sweden currently fulfils three out of the four economic criteria necessary for adopting the euro: the criteria relating to price stability, public finances and long-term interest rates. Sweden does not fulfil the criteria related to the exchange rate and legislation in Sweden is not fully compatible with the Treaty. Furthermore, the review of other factors shows that the countries examined are generally well integrated economically and financially in the EU. However, some of them still experience macroeconomic vulnerabilities and/or face challenges related to their business environment and institutional framework which may pose risks as to the sustainability of the convergence process. What are the convergence criteria? 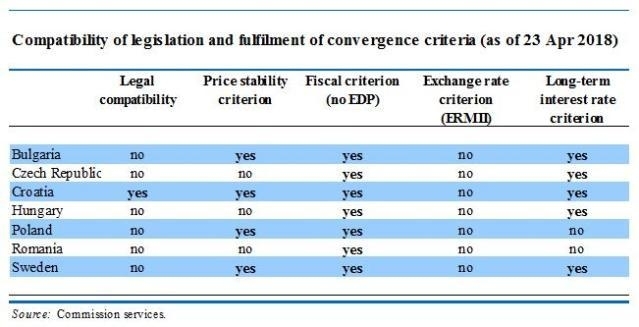 Member States adopting the euro are required to have achieved a high level of sustainable economic convergence, which is examined in the Convergence Report by reference to the convergence criteria. These criteria (sometimes referred to as the ‘Maastricht criteria') are set out in Art. 140(1) TFEU. Sustainability is a key aspect of the assessment of the Maastricht criteria, which means that the progress made with convergence must be grounded on structural elements that guarantee its durability, rather than on temporary factors. The Treaty also calls for an examination of other factors relevant to economic integration and convergence. These additional factors include the integration of markets and the development of the balance of payments. The assessment of additional factors is seen as an important indication of whether the integration of a Member State into the euro area would proceed smoothly. The Exchange Rate Mechanism (ERM II) was set up on 1 January 1999 as a successor to the original ERM to ensure that exchange rate fluctuations between the euro and other EU currencies do not disrupt economic stability within the single market, and to help non euro-area countries prepare themselves for participation in the euro area. The convergence criterion on exchange rate stability requires participation in ERM II. Participation in ERM II is voluntary although, as one of the convergence criteria for entry to the euro area, a country must participate in the mechanism without severe tensions for at least two years before it can qualify to adopt the euro. What is the process for joining once the Member State meets all the necessary criteria? Based on the Convergence report, the Commission submits a proposal to the ECOFIN Council which – having consulted the European Parliament, and after discussion among the Heads of State or Government – decides whether the country fulfils the necessary conditions and may adopt the euro. If the decision is favourable, the ECOFIN Council takes the necessary legal steps and – based on a Commission proposal, having consulted the ECB – adopts the conversion rate at which the national currency will be replaced by the euro, which thereby becomes irrevocably fixed. Which of the countries that joined the EU in 2004 or 2007 have already adopted the euro? So far, seven of the 12 Member States that joined the EU in 2004 or 2007 have already adopted the euro. Slovenia did so in 2007, Cyprus and Malta in 2008, Slovakia in 2009, Estonia in 2011, Latvia in 2014 and Lithuania in 2015. Currently, more than 338 million people in 19 EU Member States use the euro. The euro area Member States are: Austria, Belgium, Cyprus, Estonia, Finland, France, Germany, Greece, Ireland, Italy, Latvia, Lithuania, Luxembourg, Malta, the Netherlands, Portugal, Slovakia, Slovenia, and Spain. Are Member States obliged to join the euro? In principle, all Member States that do not have an opt-out clause (i.e. United Kingdom and Denmark) have committed to adopt the euro once they fulfil the necessary conditions. However, it is up to individual countries to calibrate their path towards the euro and no timetable is prescribed. The Member States that joined the EU in 2004, 2007 and 2013, after the euro was launched, did not meet the conditions for entry to the euro area at the time of their accession. Therefore, their Treaties of Accession allow them time to make the necessary adjustments. How does the Commission support Member States on their way to join the euro area? The Commission supports Member States converging to join the euro area inter alia through technical support provided by the existing Structural Reform Support Service (SRSS). As part of its proposals to deepen Europe's Economic and Monetary Union, for 2018-2020, the Commission proposed to set up a dedicated work stream within the Structural Reform Support Programme (SRSP) to provide technical support, upon request, to non-euro area Member States wishing to join the euro area. As part of its Multiannual Financial Framework (MFF) proposal, for the period post 2020, the Commission has announced its intention to propose a dedicated Convergence Facility. In the post-2020 period, the Convergence Facility will provide dedicated financial and technical support to Member States which have taken demonstrable steps towards adopting the single currency within a given timeframe. The aim is to support the implementation of reforms targeted to help prepare for successful participation in the euro area. It does not affect the criteria in place for accession to the euro area, but will facilitate practical preparation and convergence, based on a specific process of commitment and partnership. What are the benefits of adopting the euro? - Stable prices: In the 1970s and 1980s many EU countries had very high inflation rates, some of 20% or more. Inflation fell as they started preparing for the euro and, since its introduction, inflation has averaged less than 2% in the euro area. Price stability means that citizens' purchasing power and the value of their savings are better protected. - A more transparent and competitive market: The euro brings price transparency to the single market. Consumers can easily compare prices across borders and find the best price for a product or service. Greater price transparency also increases competition between shops and suppliers, keeping downward pressure on prices. - Lower travel costs: The cost of exchanging money at borders has disappeared in the euro area. This makes it cheaper and easier to travel. - More cross-border trade: Within the euro area, there is no need for businesses to work in different currencies. Before the euro, a company would need to take account of the risk of fluctuating exchange rates and currency exchange costs alone were estimated at €20 to €25 billion per year in the EU. The lack of exchange risks or costs facilitates cross-border trade within the euro area. Not only can companies sell into a much larger ‘home market', but they can also more easily find new suppliers offering better services or lower costs. - More international trade: The euro area is also a large and open trading bloc. This makes doing business in euros an attractive proposition for other trading nations, which can access a large market using one currency. Euro area companies also benefit because they can export and import in the global economy using the euro. This reduces the risk of losses caused by global currency fluctuations. - Better access to capital: The euro gave a large boost to the integration of financial markets across the euro area. Capital flows more easily because exchange rate risks have disappeared. This allows investors to move capital to those parts of the euro area where it can be used most effectively. Belonging to the euro area means much more than simply sharing a currency. It is about belonging to a community based on responsibility, solidarity and mutual benefits. It should also be stressed that the benefits of the euro are not unconditional and depend on the Member State's capacity to operate smoothly inside the Economic and Monetary Union, based on sound policies. Thorough preparation for euro area membership is essential. What are the results of the Eurobarometer survey on attitudes in the non-euro area Member States covered by the Convergence Report? According to a new Eurobarometer survey, published today, support for joining the euro in the non-euro area Member States covered by the Convergence Report is up 4 percentage points to 51% on last year's figure. and their expectations about the adoption of the euro both for themselves and for their country, and the potential positive or negative consequences they foresee. A Eurobarometer survey published in December 2017 showed that support for the euro amongst citizens in the euro area is at its highest level since 2004.